Annie-Mation: This is What I Call Victory. This is What I Call Victory. Didn't sleep well last night, forgive my death face. My second painting for painting class. I don't normally post my homework but I feel like I actually accomplished something here. Maureen is going to kill me when I don't show up tomorrow. Wow Annie...that is so cool! I can't tell, but was it done with water color? I love the color as well it gives it a certain quality...I can't find the word I'm looking for but job well done! 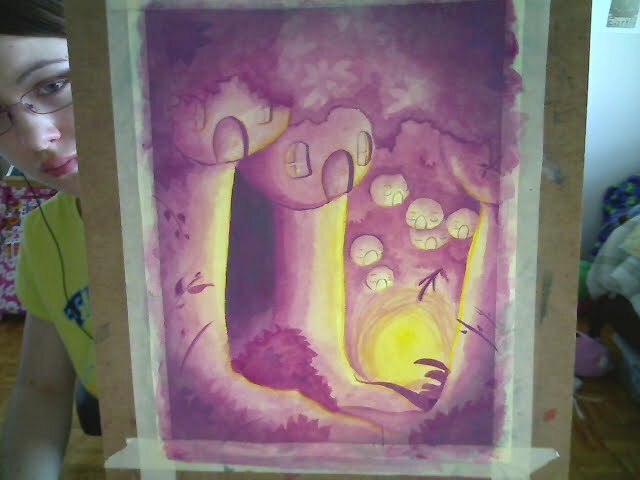 Not quuuite water colour- I was working with Acryla-Gouache, which is like, a mix of acrylic and gouache. Gouche is sort of a mix between watercolour and acrylic- It's opaque like acrylic, but can be re-activated by water, kinda like water colour. Acryla-gouache is PERMANENT like acrylic, so I can water it down in work in thin layers and not have to worry about picking up old colours and making mud. Basically, it's permanent water colour, ahha! Beautiful stuff- I owe Sarah for letting me use it. Don't tell my teacher, lol.